The high street chain saw a 1.1% like-for-like uplift in the six weeks to December 24 – the lowest growth of all of the brands in the Theo Paphitis Retail Group. The trading update follows a year of positive trading for Dyas but profits took a hit from heavy investment in infrastructure and digital offer. The group as whole - which includes stationers, Ryman, and lingerie chain Boux Avenue - delivered positive growth over the six-week period, with LFL sales up 3.6%. With Robert Dyas seeing only marginal growth, Mr Paphitis suggests the heavy discounting in the lead up to the peak Christmas period may have diluted sales for many retailers across the sector. “Black Friday has become a permanent fixture during peak trading and perhaps takes the edge away from the Christmas peak as we knew it,” he said. However, the retailer’s online growth outstripped the rest of the brands in the group, with an increase of 36.7% for the six-week period. Mr Paphitis explained: “Robert Dyas has successfully developed its ranges and was able to build on growth delivered online earlier in the year.” The business was also able to deliver margins ahead of last year, which the group described as “very encouraging”. 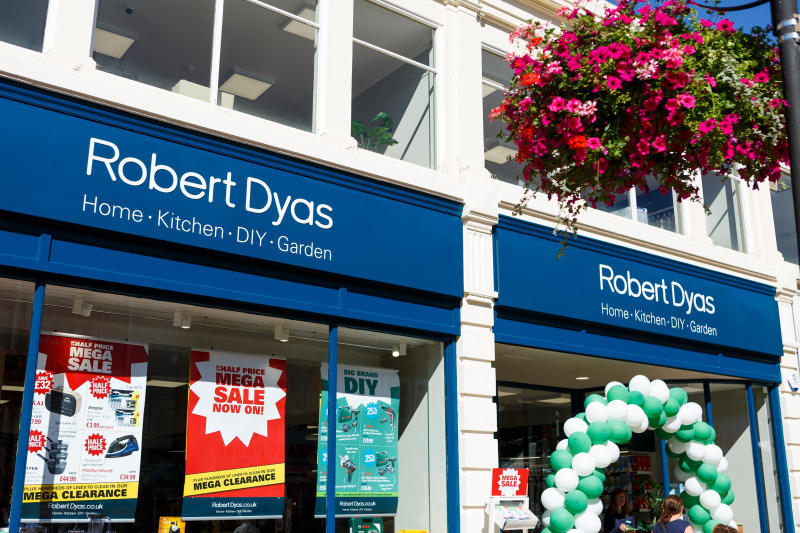 Whilst Robert Dyas is reaping the rewards of improvements made within the business – particularly online - the investment made a dent in its full-year performance. Dyas saw LFL sales grow 2.7% for the year to March 31, 2018, assisted by a particularly strong performance from its e-commerce side of the business, which jumped 45.7%. According to the retailer, this growth has showed no signs of slowing and has continued into the current year. Strong click-and-collect take-up from customers has helped boost this figure, as 50% more orders are now being delivered via that service. The option for consumers to collect orders from Ryman stores nationwide, as well as Dyas outlets has, no doubt, had a positive impact on demand. But, despite LFLs sales rising nearly 3%, turnover at £123.9million, remained fairly flat; up just £500,000 on the previous year, which wasn’t enough to claw back the outgoings for internal improvements. A £780,000 loss in operating profit was also reported and EBITDA was just £500,000 against £2.4million in the prior year. Dyas explained the retailer’s decline in profit was partly impacted by one less week of trading (the previous results had been for 53 weeks), fixed costs, and moreover, “investment made in infrastructure to support growth plans”. Significant investment has been made in technology and infrastructure at Dyas – funded by the retail group’s own resources – including increasing warehouse automation, the opening of new stores and enhancing the digital side of the business. A new group customer services department was also established during the year. Since the business was acquired by Theo Paphitis in 2012, Dyas has already benefitted from a new warehouse and systems, a website relaunch and relocation to the group’s head office in Wimbledon. However, the latest round of investment has been made in order to meet demands from strong e-commerce growth seen through the summer months and into Christmas peak this year. The retailer opened a new store in Bromley – a location that was chosen due to strong demand for click-and-collect orders to the town’s Ryman store, and a joint store format was also launched with Ryman in Bexleyheath. The concept of both brands under one roof has been “well received by customers” says the retailer and the store is trading ahead of expectations, with plans in place for a further roll-out of the format and active search for new suitable locations. Meanwhile, the group has said trading in current year for Dyas is already ahead of last year in both sales and profit.